Now with USB 3.0! 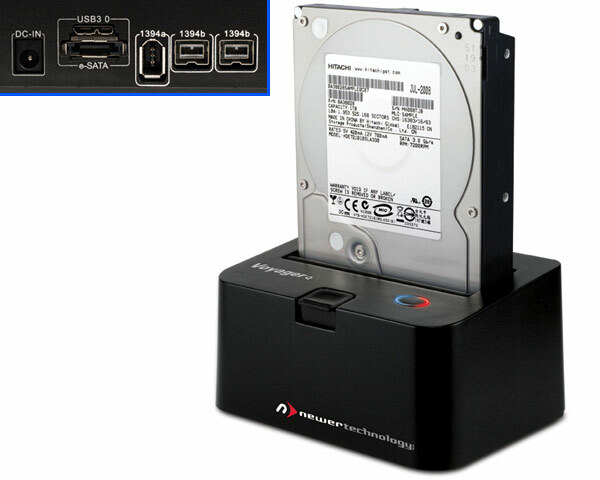 Whether you're on a data recovery mission or just want to check the contents of an older swapped out hard drive, NewerTech Voyager Q is the easiest, most convenient way to access data from any Serial ATA (SATA) hard drive. Just insert any standard 2.5" or 3.5" SATA I/II/III hard drive with up to 4.0TB capacity into the compact docking base and select one of the four interfaces supported by your Mac® or PC (FireWire® 800/400, USB 3.0/2.0/1.1, eSATA) for the fastest data transfer performance. Then, start reading and/or writing data to the docked hard drive. There’s nothing else to install or configure! *Use of eSATA interface requires system reboot in order to recognize hard drive.